Magie Fragile - nostalgieeternelles Webseite! Background/Info: Nostalgie Eternelle is a German duo that was mainly active during the 80s and early 90s. The band has been brought back to life with some re-editions of early material on labels like EE Tapes, Infrastition and Final Muzik. The growing interest for the band seems to have reactivated the duo. This album is a selection of songs that were composed during the past few years. Content: Time doesn’t really have its impact on Nostalgie Eternelle. The sound remains inspired by the 80s electronic experiments mixing new-wave and synth-pop music. It sounds pretty minimal with this good-old analogue magic flavor on top of the songs. This kind of production once more proves that the sound of analogue gear is something unique. 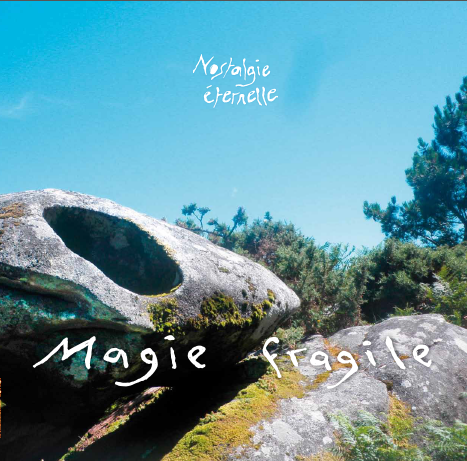 “Magie Fragile” moves in between pure experimentalism and 80s electro-pop. Sometimes it sounds a bit spooky and later on still minimal, but danceable. The vocals aren’t the main focus on this album, but it now and then adds a cool extra effect. + + + : The electronic new-wave music of the 80s has been reactivated on this disc. I think it’s totally appropriated to release it on vinyl format, just to reinforce the truly spirit of the creation. This album brings us back to the nostalgia of analogue synthesizers and old rhythm box rhythms. – – – : The minimal- and especially experimental aspect of the work will clearly not be accessible for a wider audience. This is an album for ‘purists’! Conclusion: Nostalgie Eternelle is a fully appropriated name for the nostalgia of this kind of music. It first of all remains an efficient cure to forget contemporary bands that only swear by software programs and easy presets. Best songs: “One Tree”, “Magie Fragile”, “Wir sind Hier”, “A Click”. Heidewitzka, was ist das denn? Elektronische, häufig leicht verträumte Soundkollagen mit einem Hauch Esoterik, oft ohne klassische Songstrukturen. Irgendwo im Dunstkreis von Minimal- / Post-Wave und Industrial: vielleicht auch einem Tick Post-Punk. Die Stücke sind teilweise rein Instrumental. Mit deutschem Gesang der wechselnden Sänger holen sich mich dann ein bisschen ab und erinnern entfernt an die experimentelle Stücke der ganz frühen DAF zu Zeiten von "Die Kleinen und die Bösen" oder "Produkt der Deutsch Amerikanischen Freundschaft", inklusive der dadaistischen Texte. Leider allerdings nicht durchgehend so faszinierend und einnehmend. Dafür fehlt ihnen die Punk-Radikalität. Die Band hat scheinbar zwei Leben: Eines in den Jahren 1987 bis 1991 und dann ein zweites seit dem Juni 2011. "Sans Fin" stammt bereits aus dem Jahre 2012, während "Magie Fragile" frisch erschienen ist, allerdings ebenso ältere Stücke (11) aus den Jahren 2009 und 2012 enthält. Alles hat eine große Dichte, Nähe und Wärme. sind WÜSTENRITT und VIRUS, gefolgt von NO CABE DUDA und VALLEY OF HARMONY.